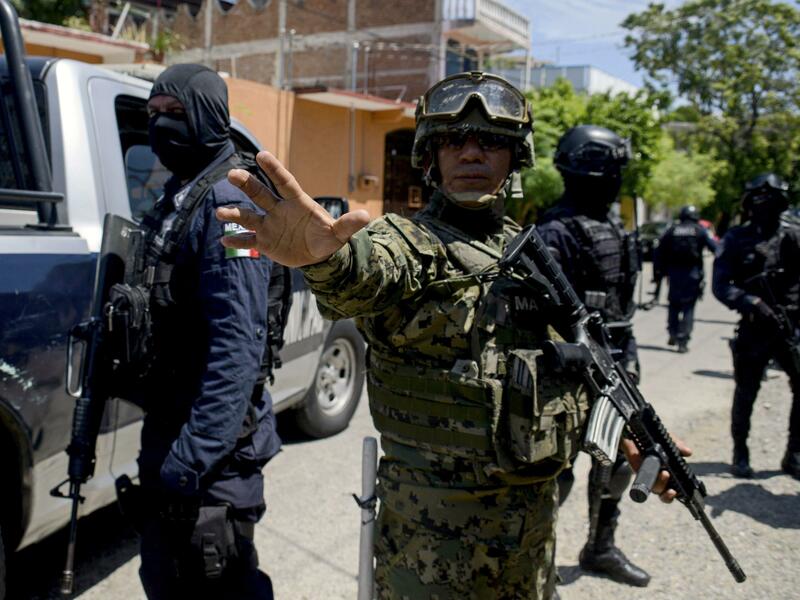 Mexican navy members and federal police take part in an operation in Acapulco in the state of Guerrero, Mexico, on Tuesday to disarm local police. The dramatic step was taken "because of suspicion that the force had probably been infiltrated by criminal groups" and due to "the complete inaction of the municipal police in fighting the crime wave," the state government said. Officials in Guerrero, the state where Acapulco is located on Mexico's southwestern Pacific coast, also issued arrest warrants for two city police commanders accused of murder. Guerrero is considered one of the most violent regions in Mexico, with criminal gangs overseeing the cultivation of poppies for the production of heroin. The Washington Post last year described Acapulco, once a glittering resort for foreign travelers, "Mexico's murder capital." The joint operation by Mexico's armed forces — including the country's navy, as well as federal and state police — caused the U.S. Embassy in Mexico City on Tuesday to reiterate a warning to U.S. citizens against travel to Guerrero, where "Violent crime, such as homicide, kidnapping, carjacking, and robbery, is widespread." Mexico News Daily reports that the Acapulco municipal government, headed by Mayor Evodio Velázquez Aguirre, had offered its full cooperation with investigators. As The Washington Post noted last year, "when ... Aguirre took office in October 2015, he said, the municipal police force was 'totally out of control.' "
"Half the 1,500 officers had failed federal vetting and background checks. The police had spent much of 2014 on strike to protest salaries and benefits, leaving state and federal forces in charge," the Post said. "Last year, Acapulco had a homicide rate of 103 per 100,000 inhabitants, one of the highest in Mexico and the world. Local police in several parts of Mexico have been disbanded because they were corrupted by drug cartels. In Guerrero alone, local police have been disarmed in more than a dozen towns and cities since 2014, though none as large as Acapulco. In the northern state of Tamaulipas, one of the hardest hit by drug violence, almost all local police forces state-wide have been disbanded since 2011."